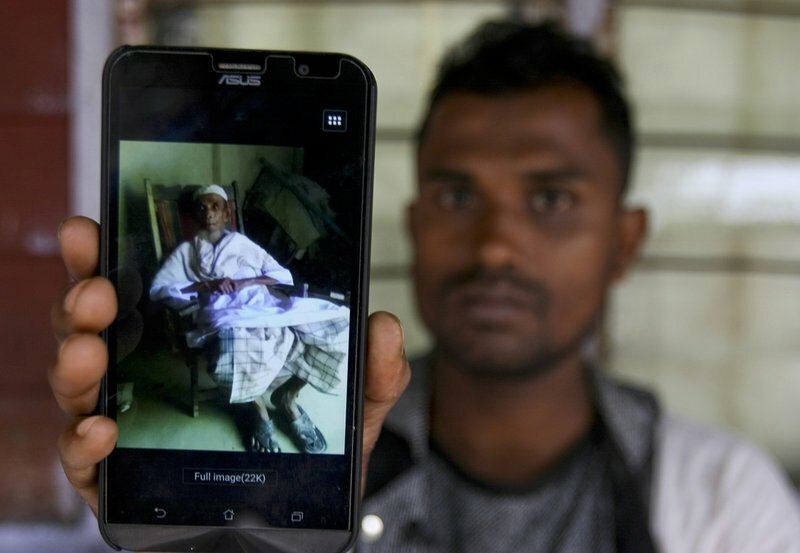 Rohingya refugee Muhammad Ayub shows off a picture of his grandfather allegedly killed during recent violence in Myanmar, in Klang on the outskirts of Kuala Lumpur, Malaysia. KUALA LUMPUR, Malaysia — Recent violence in Myanmar has driven hundreds of thousands of Rohingya Muslims to seek refuge across the border in Bangladesh. But Rohingya have been fleeing persecution in Buddhist-majority Myanmar for decades, and many who have made it to safety in other countries still face a precarious existence. Some are barred from working or feel unwelcome in unfamiliar lands. Still, many say they are relieved to be safe. There are some 56,000 Rohingya refugees registered with the U.N. refugee agency in Malaysia, with an estimated 40,000 more whose status has yet to be assessed. Obtaining a U.N. refugee card generally protects people from arrest. They live on the fringe, unable to legally work because the country — like Thailand and Indonesia — doesn’t recognize asylum seekers or refugees. Most scrape by on dirty or dangerous jobs that are shunned by most Malaysians. Most live in squalid shantytown settlements, cramped low-cost flats or isolated houses where they work on construction sites, restaurants, factories and plantations. They have no access to free health care and state-run schools. But for many, even living on the margins of Malaysian society is an improvement from what they faced in Myanmar. Another Rohingya who has been in the Southeast Asian country for six years, Ibrahim Mohamad Hussein, said he worried about the fate of his relatives who are among some 200 people still living in his village in Myanmar. Earlier this year, Malaysia started a pilot project to let Rohingya refugees with UNHCR cards work to prevent them from being exploited as cheap labor. But officials said the response was poor, as most Rohingya did not want to leave their communities to work in plantations or factories far away. Malaysia has been cautious of being swamped by an influx of migrants. In 2015, boats carrying Rohingya and Bangladeshi refugees were pushed back into international waters by the Malaysian and Thai navies. But Malaysia and Indonesia later took more than 1,600 of the refugees in. On Monday, Malaysian officials said they were bracing for a possible new influx of Rohingya amid the renewed violence in Myanmar and pledged that anyone arriving by boat would be treated humanely. New arrivals would be given water, food and medical aid, before being handed over to the Immigration Department, said Malaysia Maritime Enforcement Agency Director-General Zulkifli Abu Bakar. A Rohingya woman carrying her child walks toward her temporary shelter in a camp in Kathmandu, Nepal. Only about 250 Rohingya live in Nepal since anti-Muslim riots erupted in Myanmar in 2012, according to the U.N. refugee agency, which offers them education and medical support. 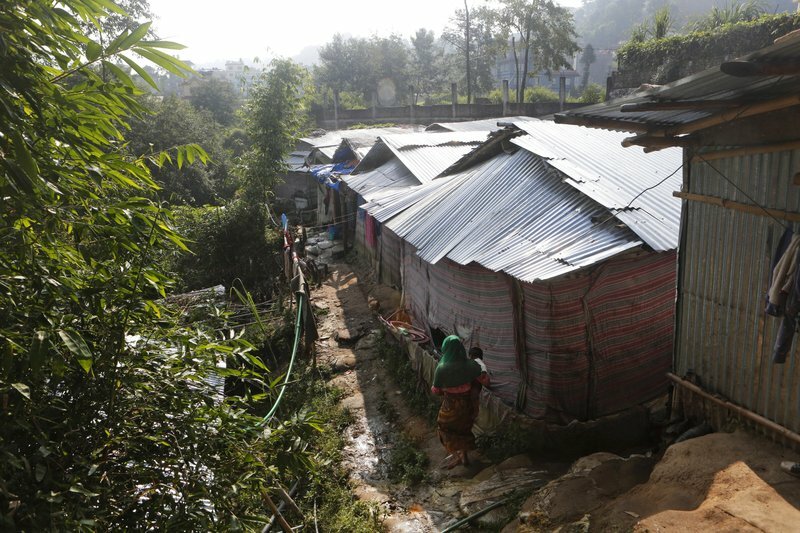 The refugees live in a ramshackle camp carved out on a slope on the outskirts of the capital, Kathmandu. Their huts of tin, bamboo and plastic sheets are connected by narrow stone steps. There is also a large communal hut, where children study the Quran each day before school and men gather to discuss the latest news from Myanmar received in phone calls from family. Most Rohingya in Nepal work as day laborers, masons or plumbers. They don’t get paid regularly, and also have trouble with language barriers, they said. But they live in peace, and local businesses and social workers have donated tin sheets and bamboo for them to build their makeshift homes. “We have not had any problems with the local people or the authorities. They are helpful,” Aalam said. Still, many dream of going back to Myanmar. “Nobody wants to live in a foreign land far from everything we know,” said Mohammad Iyer, who fled four years ago with his five children and wife after he was attacked. Rohingya in India face an uncertain future, with the Hindu-nationalist government threatening to deport them back to Myanmar. There are some 40,000 Rohingya living in clusters around the country, including in the northern Jammu region in Kashmir, the capital of New Delhi and the southern city of Hyderabad. But only 16,500 have been registered with the U.N. refugee agency. Analysts say Prime Minister Narendra Modi is walking a tightrope between Bangladesh, an ally now besieged by hundreds of thousands of new Rohingya arrivals, and his Hindu-nationalist power base at home. Modi made no mention of the Rohingya crisis during a visit last week to Myanmar, but later said through the Foreign Affairs Ministry that India was concerned about the violence and wanted Myanmar to show restraint. That delayed response followed pointed appeals from Bangladlesh for help. The Indian government is also facing a backlash over its order last month for states to prepare to deport illegal immigrants, including Rohingya. The Supreme Court is expected to hear the government’s arguments for the order at a court hearing on Monday. Even if Rohingya are allowed to stay in India, their lives are far from secure. In Hindu-dominated northern city of Jammu, where more than 6,000 Rohingya live in squalid temporary shelters of burlap and plastic sheets, the city’s business community recently announced a campaign to “identify and kill” Rohingya, but then called it off after the government announced its deportation plans. “They have no right to be in the region,” said Rakesh Gupta, president of the Jammu Chamber of Commerce and Industry. More than 2,100 kilometers (1,300 miles) to the south in the city of Hyderabad, another 4,000 Rohingya live in constant fear of being evicted from their makeshift shelters of tarp stretched across bamboo poles and sent back to Myanmar. Hyderabad’s Muslim population and some of its leaders have rallied to their cause and demanded they be allowed to stay. Aid groups are helping the new arrivals to secure identity cards from the UNHCR, a process which takes about three months. The Rohingya who have made it as refugees to the United States find a warmer welcome and a more stable life. Only 54 arrived in 2010 and were resettled. By 2016, that number reached 2,276, according to the State Department, though so far this year it was just 1,027. Hitay Lwin Oo, a Rohingya man who arrived in 2004, helps others as they come in to Utica, New York, where he owns the Golden Burma grocery store. While Rohingya can be ostracized by other groups in their home country, Lwin Oo said people from the many different tribes of Myanmar get along once they immigrate to the U.S.
“They are happy here, they have no danger in their lives, no more trouble,” Lwin Oo said. His own son is a Marine, his eldest daughter is studying to be a nurse, and his other two daughters are still in school. Starting from scratch can be hard, but nonprofit agencies help families get apartments to rent. They usually can find minimum-wage jobs cleaning offices, cutting grass at golf courses, manufacturing windows or doing other work. Their kids start school, and quickly learn English. “Arrivals in the United States have a much, much better situation than any other part of the world,” Penn State professor Wakar Uddin, a Rohingya advocate who arrived decades ago as a student. In total, the U.S. has resettled 7,362 Rohingya since 2010, with the largest group of about 1,000 in Chicago and others are in California, Indiana, Georgia and other states. Simon Billenness at the nonprofit International Campaign for the Rohingya said he wished the U.S. would take in more. “You’re talking about a group of people who are being ethnically cleansed, pushed out of their homes and villages and put into what can only be called concentration camps” in Myanmar, Billenness said. Even if the new arrivals struggle and need help, “they’re glad to be in a safe place,” said human rights advocate Adem Carroll at the Burma Task Force USA. Recent violence in Myanmar has driven hundreds of thousands of Rohingya Muslims to seek refuge across the border in Bangladesh. But Rohingya have been fleeing persecution in Buddhist-majority Myanmar for decades, and many who have made it to safety in other countries still face a precarious existence.